God is in the details. Legendary architect Ludwig Mies van der Rohe said it. German art historian Aby Warburg said it before Mies ever did. 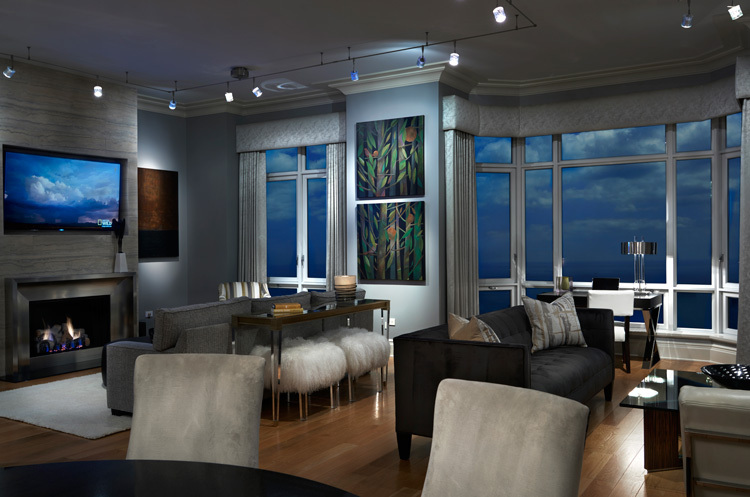 And I say it every time I visit our clients’ home at 2550 Lakeview – Lincoln Park’s elegantly gracious crown jewel. Working closely with the owners, we refined their second home, a three bedroom residence, introducing some thoughtful personal touches that reflect the erudite, well-travelled couple’s lifestyle. 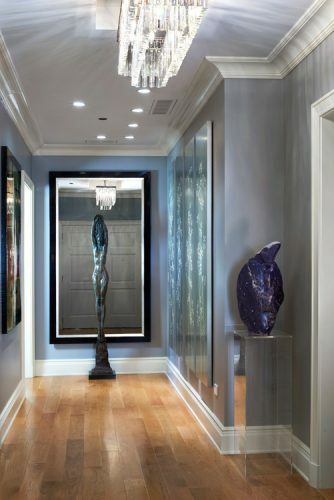 We removed several vestibules from the entry and modified the lighting to create a dramatically illuminated gallery that effectively showcases their art. We designed a silver travertine clad fireplace especially suited to the large salon featuring a pair of paintings by the owners’ daughter. Many of the furnishings and accessories from the family’s private collection enhance the room’s hospitality. Since the dining room’s concrete ceiling could not be channeled, we created a classic medallion to house the electrical connection enabling the chandelier to be centered above the granite top table. 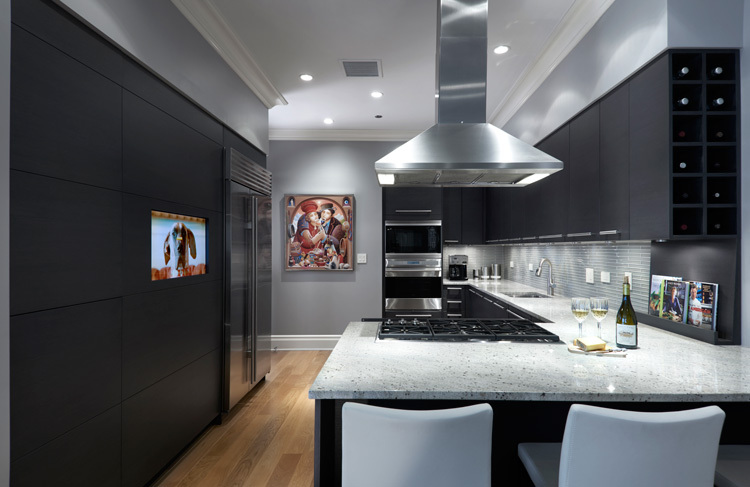 When the clients entertain, the backlit server augments the dining room’s ambient lighting. To achieve a more custom look for the builder’s kitchen, a paneled storage wall and a pull out pantry were added which extends the visual footprint. Additional wall hung cabinets above the counter provide more storage and a home for wine. 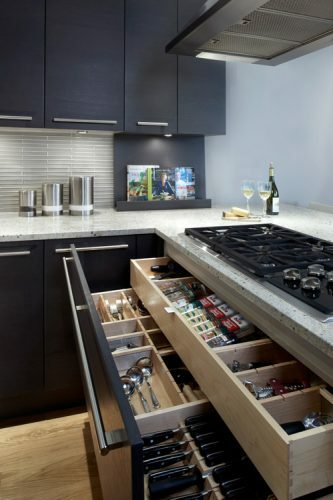 We enhanced the ready made drawers with convenient rolling trays equipped with adjustable dividers for flatware, cooking utensils, and spices. 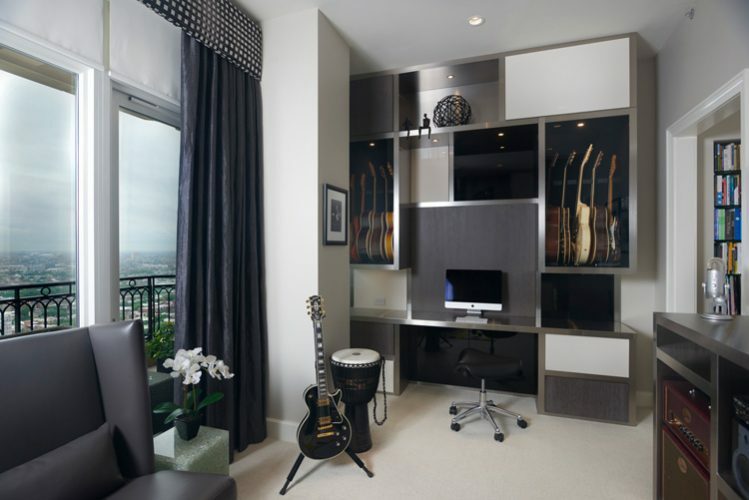 The third bedroom was transformed into a music room. 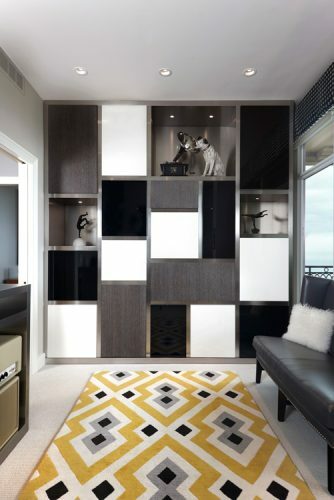 Custom built-ins disguise a Murphy bed and offer convenient storage for overnight visitors. Built-in cabinets include humidifiers to protect the owners’ prized guitars, while an adjacent vestibule includes a bookcase we recessed in the wall. 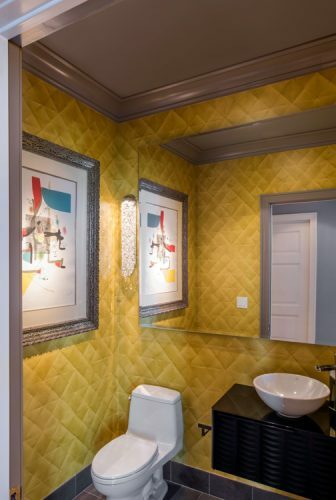 Wallcovering that appears three-dimensional gives the powder room a sensual “quilted’’ look (which everyone has to touch) providing an interesting backdrop for the owners colorful Miro painting. Only God knows if Mies would approve of our detailing, but our clients love it. ©2016 John Robert Wiltgen Design, Inc. All rights reserved.